This book will use practical exercises in easy stages to help you learn the rules you need to understand. 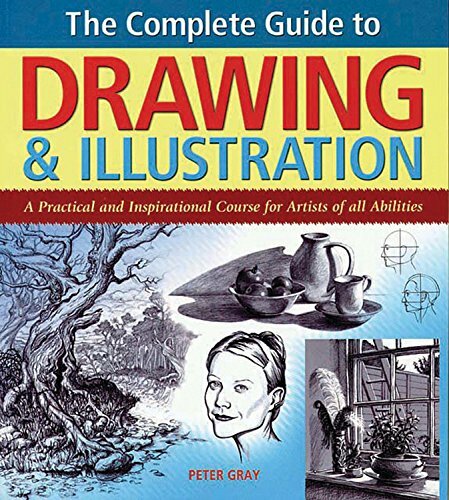 It is not so much a reference volume as a complete and hands-on course in drawing, suitable for beginner and improver alike. The aim throughout The Complete Book of Drawing and Illustration is to demystify the subject and, at every stage, treat drawing as a rewarding activity that encourages observation, experimentation and play. The emphasis is on developing a personal drawing style and the practical application of your growing skills in the comprehensive sections on illustration and cartooning. Once you have mastered all the basics, you will find that you have a new world of creative expression at your fingertips to be employed as you choose. If you have always wanted to excel at drawing, then The Complete Guide to Drawing & Illustration is the book for you. All you need is a pencil, a bit of blank paper, and the expert guidance you will find within these pages. This book is designed to systematically teach you the essentials of drawing and lays the groundwork for you to develop your own personal drawing style.